“Go back!” my daughter living in South Korea exclaimed, as I walked past a mirror on one of our weekly Skype chats. Typically, she only sees my frumpalious mug on our calls, but this time she caught a glimpse of the Full Mommy. “Holy mother of Buddha Mom, you’re nearly normal!” she proclaimed. That cracked me up! Normal? Moi? Ha! That statement be cray-cray on soooo many levels! After we stopped laughing, she asked me turn around slowly – front, back, sideways – so she could have a good look at the woman deflating 10,737 km away. Some of you might think that was an insensitive comment, but to me, “nearly normal” was an impossible reality I only dreamed of achieving. My girls have never known a nearly normal Mom – I’ve been obese their entire lives, with the occasional less tubby moments when I stuck to a diet for more than 5 minutes. I had a similar reaction recently when my other daughter (the one who lives in Toronto and would never break her mother’s heart by moving to the other side of the planet), hugged me and said, “Oh my gosh Mom, I’ve never been able to put my arms completely around you before.” Now THAT’S sad – just think of how many full hugs I missed out on from the two people I love most on this planet! After my Skype chat, I went about my day but my thoughts swirled around my daughter’s comment. What is ‘normal’ anyway? To an Indie rocker, giant holes in their ears is normal, but to a nun, not so much. Since ‘normal’ is subjective, I turned to math and science, and used the grand-poobah of tools on body fat ratio – the BMI scale – to see if I fit the definition. Trust me, no one hates that thing more than me! I’ve languished in the fiery inferno of the red-zone known as “extremely/morbidly obese” my entire adult life, dreaming of the day when I could move into the less hellish purgatory known as ‘obese’ in the orange zone. When I started my experiment a year-and-a-half ago, I tipped the scales at 253.8 lbs, and on my 5’3.5” frame, that put me at 44.25 on the chart. Not good. After today’s weigh-in, at 168.9 lbs (down 84.9 lbs since starting the experiment) I finally made it to the sunny side of the street, and currently reside in the cheery yellow ‘overweight’ section at 29.45 BMI! That’s freaking AWESOME! 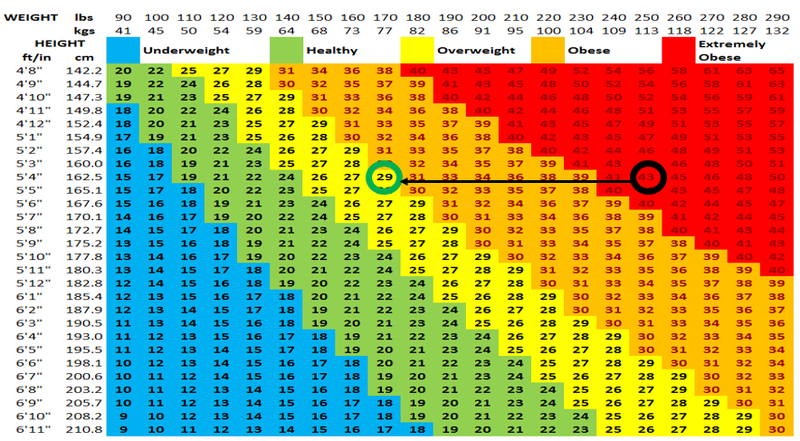 I know I’m still overweight, but there is a range of overweightiness, and I’m no longer in the orange or red zones, which in disaster movies would mean the leader of the free world would be calling for an evacuation of the planet. Transitions like that don’t happen overnight, and it will be a journey yet to get into the refreshing green, pastoral Shangri-La ‘normal’ section, but at least I’m going in the right direction this time. More importantly, I have the tools and support to not only get there, but set-up camp for good. To find out how much I lost since my last weigh-in, click here. 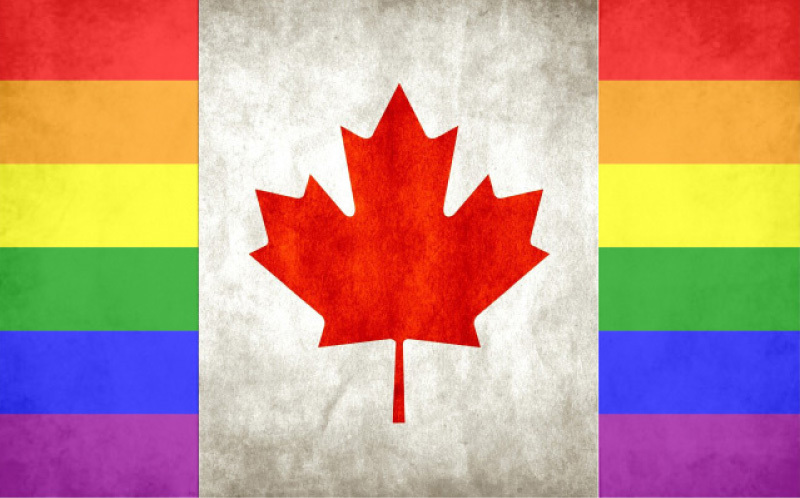 Happy Canada Day and happy PRIDE week to my friends in the LGBT community!